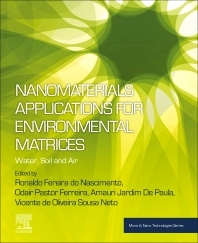 Nanomaterials Applications for Environmental Matrices: Water, Soil and Air takes a highly interdisciplinary approach in evaluating the use of a range of nanomaterials for various environmental applications, focusing, in particular, on their use in soil remediation, in improving water cleanliness, and in improving air quality. The book will not only help both materials scientists and environmental scientists understand the role played by nanomaterials in achieving these goals, but also give them practical ways they can be used to this end. Ronaldo Ferreira do Nascimento is a full Professor of Chemistry at the Federal University of Ceará, Fortaleza, Brazil. His research is in the field of Analytical Chemistry, with emphasis on the Development of Separation Methods (gas chromatography and liquid), Environmental Chemistry (analysis of traces) and Adsorption (aqueous effluents treatment using natural adsorbents). Odair Pastor Ferreira is Adjunct Professor of the Physics Department of the Federal University of Ceará, Fortaleza, Brazil. He has also worked in the private sector as a researcher and research and development coordinator. He has five patents deposited, of which two were licensed, resulting in nanotechnology-based products launched to the market. His research interests include lamellar compounds for environmental remediation and catalysis, and the development of new materials for environmental remediation. Amauri Jardim de Paula is Adjunct Professor of the Physics Department of the Federal University of Ceará, Fortaleza, Brazil. He coordinates the Solid-Biological Interface Group. He has two patents and has written numerous articles and book chapters. Vicente de Oliveira Sousa Neto is Professor of Chemistry at the State University of Ceará, Fortaleza, Brazil. He has experience in the area of environmental chemistry, with emphasis on bioadsorption (treatment of effluent using modified and low-cost bioadsorbents), and chemistry of materials with focus on the development of thin films for photovoltaic cells.